Background: Lung clearance index (LCI) is a sensitive marker of early lung disease in children but has not been assessed in adults. Measurement is hindered by the complexity of the equipment required. The aims of this study were to assess performance of a novel gas analyser (Innocor) and to use it as a clinical tool for the measurement of LCI in cystic fibrosis (CF). Methods: LCI was measured in 48 healthy adults, 12 healthy school-age children and 33 adults with CF by performing an inert gas washout from 0.2% sulfur hexafluoride (SF6). SF6 signal:noise ratio and 10–90% rise time of Innocor were compared with a mass spectrometer used in similar studies in children. Results: Compared with the mass spectrometer, Innocor had a superior signal:noise ratio but a slower rise time (150 ms vs 60 ms) which may limit its use in very young children. Mean (SD) LCI in healthy adults was significantly different from that in patients with CF: 6.7 (0.4) vs 13.1 (3.8), p<0.001. Ten of the patients with CF had forced expiratory volume in 1 s ⩾80% predicted but only one had a normal LCI. LCI repeats were reproducible in all three groups of subjects (mean intra-visit coefficient of variation ranged from 3.6% to 5.4%). Conclusions: Innocor can be adapted to measure LCI and affords a simpler alternative to a mass spectrometer. LCI is raised in adults with CF with normal spirometry, and may prove to be a more sensitive marker of the effects of treatment in this group. In early lung disease, ventilation heterogeneity results from regional differences in small airway calibre (those beyond division 8).4 5 This can be demonstrated both in computer models of the human lung6 and from in vivo MR images7 or radiolabelled tracer gas distribution.7 8 Inert gas washout is an alternative technique which involves measuring the elimination of a non-absorbed gas as it is exhaled during tidal breathing. The gas can either be resident nitrogen washed out by breathing 100% oxygen, or an exogenous tracer gas which has first been breathed in to equilibrium. Lung clearance index (LCI), a simple marker of deranged ventilation, can be calculated from the washout curves.9 Past studies using a variety of methods have shown that LCI is reproducible and more sensitive than FEV1 at identifying early lung disease in children.9–13 In addition, Aurora et al10 showed that LCI is further raised in children infected with Pseudomonas aeruginosa and Kraemer et al13 showed LCI to be an early predictor of deteriorating lung function in children. Although an old technique,14 measurement of LCI has always relied upon complex and bulky equipment, usually assembled from separate components by the investigators themselves, and has largely been restricted to a research setting. The current best method involves using a mass spectrometer (MS) to measure the washout of the inert tracer gas sulphur hexafluoride (SF6). Although these are simpler than nitrogen washouts, MS are expensive to purchase and maintain. The purpose of this study was to investigate LCI in healthy subjects and adults with CF using a modified Innocor device (Innovision, Odense, Denmark). Innocor is a compact gas analyser and flow sensor originally designed to measure cardiac output by inert gas rebreathing. The gas analyser uses photoacoustic spectroscopy to measure several gases including low concentrations of the inert tracer SF6, making it a suitable device for ventilation distribution measurements. More information on the gas analyser is given in the online supplement (pages 2–5). To compare the performance (assessed by response time and signal:noise ratio) of the Innocor gas analyser with that of the current inert gas washout standard (MS). To adapt the Innocor device and analysis software into a clinical system for measurement of functional residual capacity (FRC) and LCI. To assess how LCI changes with age of subject in healthy volunteers. To assess the intra and inter-visit reproducibility of LCI in healthy volunteers. To use the adapted Innocor to measure FRC and LCI in normal adult subjects and patients with CF and to compare LCI with spirometry. To measure LCI, a mouthpiece fitted with a flowmeter and gas sampling port is required (fig 1). This is connected to a detachable flowpast tube which is used to supply tracer gas during the wash-in and is then removed at the start of washout. A more detailed Methods section is available in the online supplement, and the modifications to the standard Innocor patient interface are described in detail on pages 5–7. Figure 1 Patient interface used for inert gas washout with Innocor gas analyser. The signal:noise ratio at the start and end of a washout and the rise time of the gas analyser in response to a step change in SF6 concentration were assessed as described in the online supplement (page 8). Performance was compared with that of a MS used routinely for LCI measurements. The ability of the complete modified system to integrate flow and gas signals accurately was assessed using a gas calibration syringe which can be set to deliver different volumes (Hans Rudolph, Missouri, USA). This was filled with 0.2% SF6 in air (BOC, Guildford, UK) to a range of different starting volumes and a washout performed by incomplete filling and emptying of the syringe around this starting point. The syringe volume derived from the calculated “expired” volume of SF6 was then compared with the known starting volume. Flow and SF6 data were exported for analysis on custom-built software. FRC was derived from the total expired SF6 volume, calculated by integration of flow and SF6 signals. LCI is defined as the number of lung turnovers (ie, multiples of FRC) required to reduce end tidal marker gas concentration to 1/40th of the starting value (as described in the online supplement, page 11). Forty-nine healthy non-smokers (<10 pack-years smoking history) with no active lung disease and on no regular respiratory medications were recruited as normal adult volunteers (age range 19–58 years). Thirteen healthy child volunteers (age range 6–16 years) were recruited if they had no previous diagnosis of recurrent wheeze or asthma and were taking no current inhaled medication. There was no history of significant respiratory disease requiring hospitalisation (eg, pneumonia, pertussis, tuberculosis), no prematurity (<34 weeks gestation) and no significant co-morbidity. Thirty-three patients with CF (age range 17–49 years) were recruited from the Scottish Adult CF Service, the diagnosis being based on a combination of clinical presentation and sweat testing and confirmed by genotyping. All volunteers, patients and (where relevant) parents provided informed consent. Paediatric volunteers provided assent where appropriate. This study was approved by the Lothian research and ethics committee. Subjects were seated and suitably distracted by watching television. A noseclip was applied and tidal breathing established while the subject was connected to the flowpast circuit containing 0.2% SF6 in air. This was supplied from a compressed gas cylinder with the flow rate adjusted to ensure that rebreathing did not occur. This wash-in phase continued for at least 5 min in adults or 4 min in children under 16 years and, in all cases, until inspiratory and expiratory SF6 concentrations differed by <0.004% (absolute difference in SF6 concentration). The flowpast circuit was then detached during expiration and the washout measured until the end tidal SF6 had fallen to less than 1/40th of the starting concentration (ie, <0.005%). In healthy children (<16 years) an identical gas analyser and protocol were employed at a separate research site, but a smaller filter was used to reduce the precapillary dead space (36 ml vs 46 ml in adults). Data were analysed using Prism (GraphPad Software Inc, California, USA). The results are given as mean (SD) unless otherwise stated. Within-test repeatability for LCI was determined by calculating the coefficient of variation (CV) as 100× SD/mean. Inter-visit reproducibility was assessed using the Bland-Altman technique. Correlation with age and height were assessed by multiple linear regression analysis. Numerical values for LCI and FEV1% predicted were compared using a Mann-Whitney U test. The 95% limits of normality for LCI were calculated as mean ±1.96 × residual standard deviations. A p value of <0.05 was considered statistically significant. The Innocor device has a lower gas concentration operating range than the MS. Signal quality is therefore given at the starting and finishing concentrations of a washout, which are different for the two devices (table 1). For both devices there is a fall in signal:noise ratio as the gas concentration falls, but the Innocor signal quality remains superior throughout, despite much lower SF6 concentrations. The mean (SD) SF6 10–90% rise time was 154 (5) ms for Innocor and 64 (5) ms for the MS (p<0.001). The longer rise time of the Innocor gas analyser was allowed for by offsetting gas and flow signals during analysis by an additional 50 ms. This corresponds to the 50–80% rise time of the gas signal, and has the effect of speeding the response time by realigning the flow signal with the 80% response fraction of the gas signal.19 The accuracy of this adjustment was then confirmed by integration of known volumes of SF6 from a calibration syringe. Sixteen washouts were performed using a calibration syringe with the starting volume varied between 1.5 and 3 litres. There was good agreement between the measured and actual syringe volumes (see fig 1 in online supplement II). The mean (SE) error between measured and actual syringe volume was 16.3 (2.4) ml or 1.1 (0.2)%. LCI was assessed successfully in 12 healthy children, 48 adult healthy volunteers and 33 adults with CF. The demographic data of the study subjects are given in table 2. Data from two additional healthy volunteers (one adult, one child) could not be analysed because of technical difficulties (see below). Figure 2 shows the relationship between LCI and age (min 6 years, max 58 years). In those aged >16 years there was no relationship between LCI and age. When the two cohorts were combined there was a weak but statistically significant correlation with age (Pearson r2 = 0.16, p<0.002). The small dependence of LCI on age is best summarised by a normal range (95% limits of normality) in adults of 5.9 to 7.5 and in children (⩽16 years) of 5.3 to 7.3. A weak relationship between height and LCI in the combined cohorts disappeared on multiple regression analysis. LCI was unrelated to gender of subject. By contrast, FEV1 varied between 76% and 133% predicted in the same group of 60 healthy adults and children. 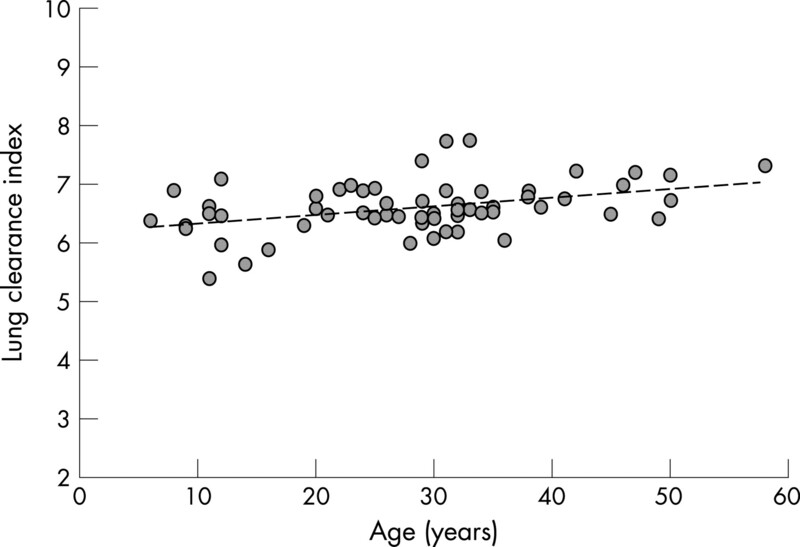 Figure 2 Effect of age on lung clearance index (LCI) in healthy volunteers. LCI remains within a narrow band of normal over an age range of 52 years. The broken line is the regression line, showing the extent of age-related increase in LCI. The group mean (SD) LCI in adult healthy controls was 6.7 (0.4) (range 6.0–7.8) with 95% limits of normality calculated as 5.9 to 7.5. In patients with CF the group mean (SD) LCI was 12.8 (3.6) (range 6.3–20.4), p<0.001 compared with healthy controls. The mean (SD) FEV1 was also significantly different between the two groups (102 (12)% predicted in healthy controls vs 68 (23)% predicted in patients with CF, p<0.001). Figure 3 shows the relationship between FEV1 % predicted and LCI for healthy controls and adults with CF. In controls LCI was restricted to a narrow range but, in patients with CF, LCI increased with reducing FEV1 % predicted (r2 = 0.69, p<0.001). 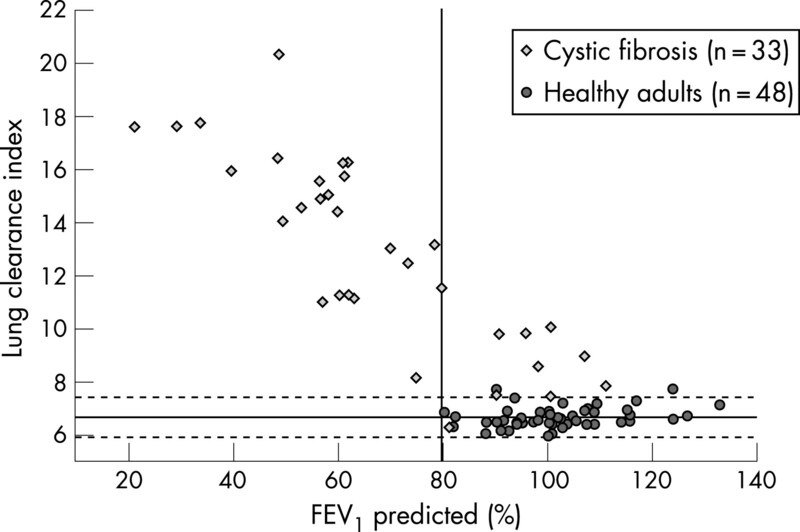 Figure 3 Lung clearance index (LCI) versus forced expiratory volume in 1 s (FEV1) % predicted for adult healthy volunteers and patients with cystic fibrosis. The horizontal line represents the mean and the horizontal dotted lines the 95% limits of normality of the LCI, calculated from the healthy adult population. The vertical line represents the lower limit of normal for % predicted FEV1. There were 10 patients with CF with FEV1 ⩾80% predicted, all but one of whom had LCI above the upper limit of normal. By contrast, LCI was marginally raised in only two healthy adults (measuring 7.7 and 7.8). The sensitivity of LCI for detecting CF was 97% compared with 70% for FEV1. A washout test was excluded if the measured FRC differed by >10% from both of the other two washouts. In adult subjects this resulted in the exclusion of a total of seven tests, representing <3% of the total number of repeats from both healthy volunteers and patients with CF. Three tests were excluded from the paediatric cohort, representing 9% of the total number of washout repeats. All three washout repeats from an additional single adult healthy volunteer could not be analysed because they were unable to achieve a regular and reproducible breathing pattern. All three repeats from an additional healthy child (age 8) were also excluded because of evidence of an air leak. After exclusion of these repeats, the mean (SD) intra-subject coefficient of variation (CV) for FRC derived from repeat washout manoeuvres on the same visit was 3.2 (1.9)% for adult healthy volunteers, 3.9 (2.1)% for healthy children and 3.5 (2.3)% for patients with CF. The mean (SD) CV for LCI was 3.6 (2.1)% for healthy adults, 5.4 (3.8)% for healthy children and 4.4 (2.8)% for patients with CF. There was no significant correlation between the LCI CV and FEV1 % predicted. Repeat measurements of LCI were performed in triplicate on 16 healthy volunteers after a mean (SE) of 36 (10) days. A Bland-Altman plot20 of the difference between repeat measures and the mean of the measurements for LCI is shown in fig 4. For FRC, the 95% limits of agreement between the two measurements were −0.43 to 0.45 litres and, for LCI, the 95% limits of agreement for the two measurements were −0.78 to 0.46. The inter-visit reproducibility of the FRC measurement was therefore approximately 400 ml and that of the LCI measurement was 0.6. Figure 4 Bland-Altman plot of difference between lung clearance index (LCI) measured on two separate occasions (quoted as mean of triplicate repeats) and mean of the two measurements of LCI. This study has shown that the clinical measurement of inert gas washout is practical using equipment that is cheaper, more portable and has more sensitive gas signal resolution than the current MS standard. We have also shown for the first time that, in adults with CF, a simple measure of ventilation heterogeneity is more sensitive than FEV1 in detecting lung function abnormalities. Finally, we have shown that this measurement is reproducible both within and between visits, and that there is little change over a wide range of subject height and age. In children with CF there is already increasing evidence that LCI is a more sensitive measure of early lung disease than FEV1.9–13 21 LCI has also been shown to correlate better with scores of airway damage on high-resolution CT scanning than spirometry.22 It may therefore fill an important gap in our ability to monitor airway function and disease progression non-invasively. Since only tidal breathing is required, it is particularly suitable for airways assessment in subjects who find complex respiratory manoeuvres difficult. The potential of multiple breath washout measurements, however, has been hampered by the lack of a convenient method of performing them.12 21 23 The original method for assessing lung clearance was the nitrogen washout. Although this avoids the need for a wash-in first, sufficient time must be allowed between tests for the end tidal nitrogen concentration to return to normal.18 The use of a MS to measure LCI by following changes in exogenous SF6 is now well described in children,12 21 and is probably the accepted gold standard technique in this population. The MS offers the additional advantage that it can measure a wider range of different gases, which is a useful option when measuring vital capacity single breath washouts.24 However, the MS is an expensive, temperamental and bulky piece of equipment that cannot readily be taken out of the laboratory. In contrast, Innocor contains both the gas analyser and the pneumotachograph in a single unit that is both portable and robust.25 A supply of SF6 is required for both systems, but the concentration required for Innocor is 1/20th of that used in the MS washouts, which reduces gas wastage and the potential environmental (greenhouse) effects of SF6. The ideal comparison would be to compare the performance of both systems simultaneously, as has been done for other gas analysers.26 However, washouts would have to be performed at the operating range of the Innocor gas analyser since the response is not linear above 0.2% SF6, but the signal resolution of the MS shows excessive noise at this level. Accepting this as a limitation of the current comparison, we have shown that the gas analyser is suitable for use in a multiple breath washout apparatus. The characteristics of the two analysers are summarised in table 2 of the online supplement (page 18). Our technical validation shows that the device with our modifications is capable of measuring gas volume by dilution with high accuracy. Despite operating at a much lower SF6 concentration, it produces washouts with a superior signal:noise ratio than a MS. Our comparison has also identified the possible limitations of the device imposed by the slower signal rise and fall time. The system is able to integrate flow and SF6 concentrations accurately at a physiological breathing rate of 10–30 breaths/min and should therefore be suitable for use in school-age children and adults. The response time may, however, limit the use of the method in neonates and preschool children with faster respiratory rates.21 27 Further in vitro assessment is required before using the analyser in this age group. To date, we have used the modified Innocor to measure LCI in more than 100 patients and volunteers. From the data presented here, over 85% of subjects are able to complete all three washout manoeuvres without difficulty and generate reproducible measurements of FRC and LCI. Even for patients with CF, the whole process (wash-in and washout) usually takes little more than 10 min, and considerably less in children. Despite the relatively uncontrolled conditions, the mean CV for repeat FRC is similar to that described in the literature, which varies from 3.5% to 6.7% for plethysmography and from 4.9% to 10.4% for helium dilution.28 The mean CV for LCI is also better than that described in children.11 Repeat measurements of LCI at a separate time point in a cohort of adult healthy volunteers also demonstrated good inter-visit reproducibility. The mean (SD) LCI determined here is very similar to that reported in the literature in children and adolescents. In preschool children (mean age 4 years) this has been reported as 6.9 (0.4),10 and in school-age children (mean age 11 years) as 6.5 (0.5)11 and 6.3 (0.4)9 in two different populations from the UK and Sweden, respectively. This supports our observation that LCI changes little with the age of the subject (>6 years). This may be especially useful during long-term follow-up studies. These are the first data on LCI in adults with CF; previous studies have only reported measurements in subjects up to 19 years of age. Even in adult patients with normal spirometry, the LCI may be markedly elevated, indicating significant “silent” lung damage. Some of the patients with normal FEV1 had no symptoms and were on no treatment, the diagnosis of CF having been made incidentally. Yet, despite this, there was abnormal gas mixing in almost all cases. There is a risk that the extent of lung disease in such patients will be underestimated and hence undertreated. While FEV1 is the currently accepted gold standard to monitor trials of new treatments for CF, the rate of decline in this parameter has steadily reduced over the last decade.33 Power calculations show that many hundreds of patients would need to be treated over a year or more to see any beneficial effect of a novel therapeutic agent aimed at the basic defect.34 We have therefore instituted a large programme to assess novel biomarkers which could act as surrogates for FEV1. Ventilation heterogeneity is thought to be altered by small airways dysfunction,4 5 and measurements of this should therefore reflect the earliest pathology in CF—as has already been shown in children.9–11 This is also the region of the lungs which is likely to be a key target for gene therapy. The choice of which subject to recruit into trials of gene therapy represents a conflict between those with sufficiently clear airways that the gene therapy complex can be delivered into the lungs and those with sufficient abnormality in lung function so that any improvement can be measured. LCI offers the ability to measure dysfunction in the airways of interest, and also to extend the range of patients suitable for these assessments. We have shown that there is the possibility of a robust and compact apparatus to measure LCI that can be used in multicentre studies after relatively straightforward modification. This will permit us to assess LCI routinely in patients to obtain longitudinal data and, in particular, it may serve as a more sensitive measure of lung function after changes in therapy. The value of this technology may, however, extend beyond just CF and we anticipate that it may provide valuable information about the development and treatment of airways disease in other conditions. In particular, it may be useful in conditions that initially affect the small airways such as asthma, chronic obstructive pulmonary disease and obliterative bronchiolitis. The authors thank all the volunteers who took part in this study. They thank Eddie Bergsten for his help in developing the software used to analyse the inert gas washout data and acknowledge the assistance provided by the Welcome Trust Clinical Research Facility at the Western General Hospital, Edinburgh.
. Outcome measures for clinical trials in cystic fibrosis. Summary of a Cystic Fibrosis Foundation consensus conference.J Pediatr1994;124:177–92.
. Resistance of central and peripheral airways measured by a retrograde catheter.J Appl Physiol1967;22:395–401.
. High-resolution computed tomography in young patients with cystic fibrosis: distribution of abnormalities and correlation with pulmonary function tests.J Pediatr2004;145:32–8.
. The relations between structural changes in small airways and pulmonary-function tests.N Engl J Med1978;298:1277–81.
. Noninvasive assessment of airway alterations in smokers: the small airways revisited.Am J Respir Crit Care Med2004;170:414–9.
. Self-organized patchiness in asthma as a prelude to catastrophic shifts.Nature2005;434:777–82.
. Imaging the lungs in asthmatic patients by using hyperpolarized helium-3 magnetic resonance: assessment of response to methacholine and exercise challenge.J Allergy Clin Immunol2003;111:1205–11.
. The distribution of ventilation during bronchoconstriction is patchy and bimodal: a PET imaging study.Respir Physiol Neurobiol2005;148:57–64.
. Evaluation of ventilation maldistribution as an early indicator of lung disease in children with cystic fibrosis.Eur Respir J2003;22:972–9.
. Multiple-breath washout as a marker of lung disease in preschool children with cystic fibrosis.Am J Respir Crit Care Med2005;171:249–56.
. Multiple breath inert gas washout as a measure of ventilation distribution in children with cystic fibrosis.Thorax2004;59:1068–73.
. Gas mixing efficiency from birth to adulthood measured by multiple-breath washout.Respir Physiol Neurobiol2005;148:125–39.
. Ventilation inhomogeneities in relation to standard lung function in patients with cystic fibrosis.Am J Respir Crit Care Med2005;171:371–8.
. A new index of the intrapulmonary mixture of inspired air.Thorax1952;7:111–6.
. Standardisation of spirometry.Eur Respir J2005;26:319–38.
. Lung volumes and forced ventilatory flows. Report Working Party Standardization of Lung Function Tests, European Community for Steel and Coal. Official Statement of the European Respiratory Society.Eur Respir J Suppl1993;16:5–40.
. Lung function in white children aged 4 to 19 years: I—Spirometry.Thorax1993;48:794–802.
. Standardisation of the measurement of lung volumes.Eur Respir J2005;26:511–22.
. Corrections for the response time and delay of mass spectrometers.J Appl Physiol1981;51:1417–22.
. Statistical methods for assessing agreement between two methods of clinical measurement.Lancet1986;1:307–10.
. Inert gas washout in preschool children.Paediatr Respir Rev2005;6:239–45.
. Measurements of ventilation inhomogeneity correlate better to structural changes on high resolution CT than conventional spirometry.Pediatr Pulmonol2005;310–1.
. Early detection of lung disease in preschool children with cystic fibrosis.Curr Opin Pulm Med2005;11:534–8.
. Mechanisms of ventilation inhomogeneity during vital capacity breaths standing and supine.Respir Physiol2002;129:345–55.
. Sildenafil increased exercise capacity during hypoxia at low altitudes and at Mount Everest base camp: a randomized, double-blind, placebo-controlled crossover trial.Ann Intern Med2004;141:169–77.
. Multiple breath washout with a sidestream ultrasonic flow sensor and mass spectrometry: a comparative study.Pediatr Pulmonol2006;41:1218–25.
. An official American Thoracic Society/European Respiratory Society statement: pulmonary function testing in preschool children.Am J Respir Crit Care Med2007;175:1304–45.
. Reproducibility of lung volume measurements.Eur Respir J1998;11:787–90.
. Effects of body posture and tidal volume on inter- and intraregional ventilation distribution in healthy men.J Appl Physiol2002;92:634–42.
. Voluntary changes in breathing pattern and N2 clearance from lungs.J Appl Physiol1961;16:1039–42.
. The effect of changing ventilator settings on indices of ventilation inhomogeneity in small ventilated lungs.BMC Pulm Med2006;6:20.
. References values for forced spirometry. Group of the European Community Respiratory Health Survey.Eur Respir J1998;11:1354–62.
. Improving rate of decline of FEV1 in young adults with cystic fibrosis.Thorax2006;61:155–7.
. Identifying treatments that halt progression of pulmonary disease in cystic fibrosis.Pediatr Res1997;41:161–5. Funding: This study was performed at the Welcome Trust Clinical Research Facility at the Western General Hospital, Edinburgh and at the Department of Child Life and Health, Royal Hospital for Sick Children, Edinburgh. Funding was provided by the CF Trust as part of the UK CF Gene Therapy Consortium.